I woke up yesterday to the news that Codecademy had raised $10 million. I decided to skip writing another screed, even though I think many of my original complaints about the site are still valid. Considering how I came a little unhinged at the $2.5 million that the startup raised last fall, I’m sure you’re all deeply disappointed that I didn’t hammer out four times as much of a rage-fest with four times as much as an investment injection. This is, after all a startup that’s still being praised and funded as the future of learning. 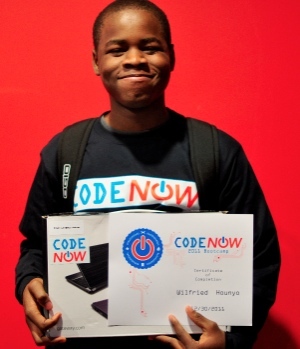 There are so many things about CodeNow that I really like: its DC location means it’s working with youth of color, and about 40% of the students who’ve participated in its programs have been girls – both of these are absolutely crucial since the tech industry and CS field remains largely white and male. And rather than building a teach-yourself-through-a-Web-based tool and arguing that that’s sufficient or “easy” or “the best way,” CodeNow takes a multi-pronged approach: There are free training sessions and bootcamps where students are introduced to programming through things like Lego Mindstorms and Hackety Hack. (The current developer on the HacketyHack project, Steve Klabnik, is one of the CodeNow instructors.) There’s ongoing access to Treehouse where students can hone their Web development and design skills. There are connection to mentors and internship opportunities via meet-ups. Attendees all receive netbooks – for many participants this is their first computer. And finally, CodeNow is project-based: students learn how to build a website or a game or a robot – a programming project that matters to them. Since then he, along with two friends from high school – Golden Rockefeller and Endre Osbourne – designed and built “Electrobob,” a game that teaches some of the fundamentals of electrons. Wilfried did all the coding The team entered the Entertainment Software Association’s STEM Video Game challenge. And they achieved co-winner honors in the Playable Game – Team category. That is awesome. Wilfried is “the reason why we do this,” says Seashore, who admits that not every student walks away from a CodeNow bootcamp wanting to become a software engineer. But that’s not the point. They do walk away having had an introduction to code and to the opportunities that knowing code can bring. And they walk away with a netbook. CodeNow's given out 41 so far. Last night, Georgia Tech professor Ian Bogost tweeted, “Reminder: when startups raise money to ‘democratize’ something, they’re really ‘commercializing’ it.” I’m not sure if he was thinking about “democratizing learning to code” and Codecademy, but after talking to Seashore earlier in the day and thinking about the comparisons between CodeNow and Codecademy, that’s certainly where my mind went. Silicon Valley pays a lot of lipservice to this – the notion that “everyone should learn to code.” But I don’t think they really mean “everyone.” Or at least, they’re not interested in lowering the barriers to entry for “everyone.” $10 million for Codecademy. Meanwhile CodeNow is largely bootstrapped. CodeNow is currently raising money via an IndieGoGo campaign. Seashore says that the non-profit needs more money in order to afford some of the expenses for its summer bootcamp. The crowdfunding campaign means that the bootcamp can go forward, even if grant-making institutions don’t come through with the money in time.